Early in my project to dayhike the lower 48’s most remote peaks, I dismissed the northern Rockies in favor of the northern Cascades. 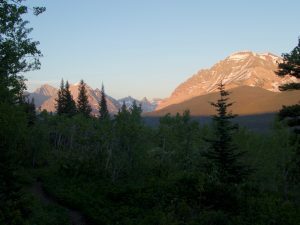 While I still believe that the Cascades contain the hardest dayhikes, the Rockies can certainly bring the pain, as I found on this harder-than-expected trip. 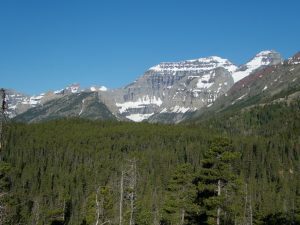 Mount Cleveland is the highpoint of Glacier National Park, and the last ultra-prominence I will climb in the conceivable future (Ibapah is a desert garbage-mound, and Mitchell and Washington are back east). 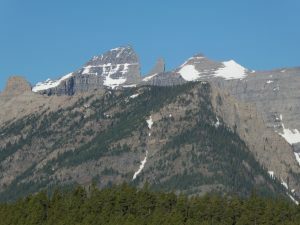 While it is normally approached via Waterton Lake and Stoney Indian Pass, that route involves Canadian border guards and a ferry. I have endured my Canadian border crossing for the year, and the ferry would mean camping, so I chose the alternate approach from the Chief Mountain trailhead near the port of entry. The first 10-ish miles are a routine trail commute past the Belly River ranger cabin, then up the Mokowanis to Glenns Lake. 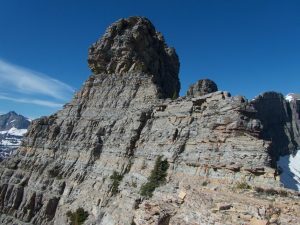 The standard route starts from Stoney Indian Lake, well southwest of the peak, then crosses some narrow, east-facing ledges. Since I was coming from the east, and the ledges would definitely hold snow this early in the season, I had to do something else. 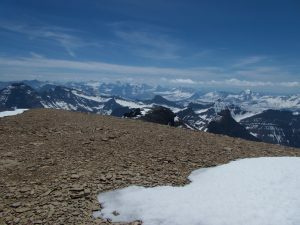 Digging around online, I found a trip report of a failed attempt from Whitecrow Lake, and a vague account of a route up Whitecrow Ridge, then across the Whitecrow Glacier and up some steep snow. The latter makes little sense on the map, and even less when looking at the terrain, and the former was less than definitive, but I assumed that I could make something work. The plan was to ascend Whitecrow Ridge, then traverse to Cleveland and find a path up its south side. Nearing Glenns Lake, I checked out my options for getting onto Whitecrow Ridge, with its mixture of steep forest and small cliff bands. Rather than starting at the toe, I decided to head up somewhere just below Point 7047′, where the trail was relatively close to the slope. This proved only mildly unpleasant, with a bit of woods-thrashing, then a bash through some fresh waist-high plants along the edge of a slide path. I occasionally had to tangle directly with the slide alder or forest, but the Cascades have hardened me to such things. Above, I had little trouble threading through the cliff bands with only a bit of class 3-4. Emerging just east of 7047′, I was confronted with a real possibility of defeat, as the small knob was steep and sketchy-looking on both sides. The south side was less steep overall, but it turns out that the ledges are more usable to the north. While there is no obvious goat-path, I found droppings here and there, and a series of ledges that got me around the knob with only one truly narrow spot. Above, I stayed on or left of the ridge, following goat trails and the path of least resistance, to eventually reach Whitecrow, a minor bump on the ridge. 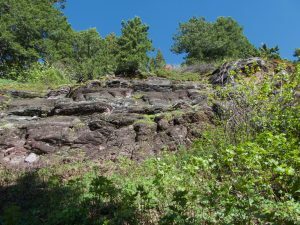 From this vantage, it became clear that a headwall blocked the direct path up Cleveland’s southeast ridge, so it would be necessary to traverse its south face to meet the Stoney Indian route. There are a couple of cliff bands on this face, but it looked like I could find connecting ledges while avoiding most of the lingering snow. There are a number of towers and gaps between Whitecrow and the face, which consumed time backtracking and downclimbing to the south, but there was no truly difficult terrain, and I soon found myself on a dirt-ledge headed across the face. 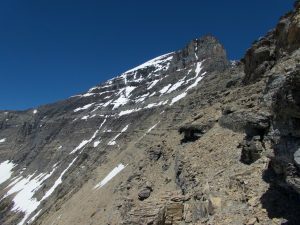 While the underlying rock is solid, the ledges are all covered in scree and dirt, some of which had turned to slick mud from the melting snow above. 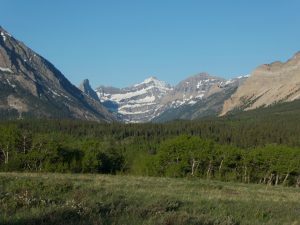 I made my way across and up the face, crossing through a steep grey band partway across, aiming for the saddle with the Stoney Indian Peaks. This made for a lot of annoying side-hilling, and a few minor stream crossings, but nothing super-exposed or sketchy. As I got closer to the saddle, I thought I would be smart and angle upward to meet the ridge on its Cleveland side. Bad move: the black rock band above my traverse ledge proved both steeper and wetter than I had expected, requiring some sketchy wet fourth class and backtracking. I eventually made it work, though, and found a faint trail and a couple cairns on Cleveland’s much easier west side. I traversed around a step in the ridge, then started climbing back toward the crest. 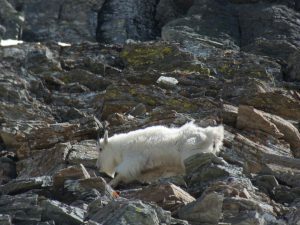 Along the way, I spotted a shy mountain goat — the only one I saw on this trip — who kicked a few rocks in my direction as he escaped. I followed the goat for a bit, then wound my own way up to the ridge. The lower end of the summit knob is a jumble of horrible basalt talus with a short third class step. 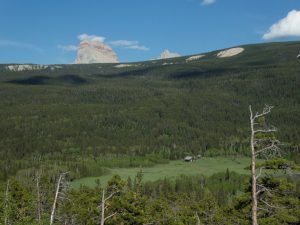 Above, the broad summit plan stretches for over half a mile, gradually rising another 400 feet to the summit on its far northern end. Cleveland is notorious for grizzly bears feeding on its summit later in the season, but I was there before the bears, and saw only a couple piles of old manure. 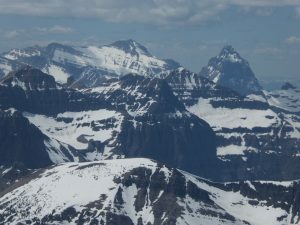 From the highpoint, the peak drops steeply 4000 feet northwest to Cleveland Creek, then another 2000 feet to Waterton Lake. 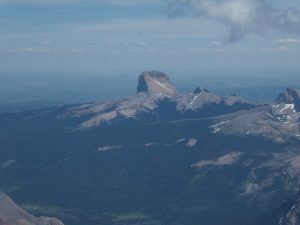 To the south, Mount Merritt rises 5000 feet on the other side of the Mokowanis. After 15 minutes, I reluctantly set out on the long slog home. I wanted to avoid the long traverse around Whitecrow Ridge, and contemplated some version of descending via Whitecrow Lake. The bushwhack below the lake was supposedly bad, but there seemed to be consistent snow in the woods above 6000 feet, and the plain above the lake was covered in nice, solid avalanche debris. I returned to the saddle, hoping to see an obvious path down to the southeast. Failing to see an obvious line, and worried about cliffing out, I decided to retrace my traverse partway to Whitecrow, where there was obviously navigable terrain down toward the lake. As it turns out, it looks like a diagonal line from the saddle toward the ridge southwest of the lake would have worked. Unfortunately, I managed to punch myself in the face with some epicly stupid route-finding. First, I thought I would try to traverse the south side of Whitecrow above the forest to reach a slide path. The side-hilling proved awful, so I eventually gave up and scree-skied into the woods. The snow was helpful in places, but not as continuous or consolidated as I had hoped, so then began the bushwhack. I ended up bashing my way down a steep, wooded hillside left of creek, tripping on hidden branches, stabbing my hand on broken twigs, climbing over rotting logs, and generally hating life. I was having flashbacks to my descent fro the Pickets via Eiley-Wiley Ridge, though at least this time was not by headlamp. As a final insult, I reached the valley bottom only to find that the trail was closer to the lake than the map suggested, across a nightmare tangle of deadfall. I think retracing my steps would have been slightly faster, but all roads to Whitecrow involve suffering. I transitioned to shorts, then started the trudge home. I expected to have the place to myself, but soon met an experienced Glacier backpacker out for the day from his camp at Cosley Lake. We talked for awhile, and he reported seeing a grizzly swimming past the camp area that morning. Joy. Fortunately I met no bears, just a couple of kids out on a camping trip. I would have told them about the swimming grizzly, but they didn’t seem talkative. My wet feet were sore, so I actually enjoyed taking my shoes off to wade through the 50-yard stretch below Cosley where the trail had become a stream. Nearing the ranger cabin, I looked up to see a fox staring intensely at something in a meadow 100 yards away. 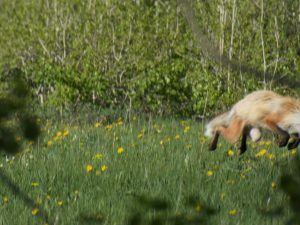 I zoomed all the way in and focused on it, but I remain a bad photographer: right as I released the shutter, the fox pounced on its prey, and I got the back half of a Nat Geo action shot. I took a couple more photos as the creature sized me up, then took off again jogging for home. A couple miles past the ranger cabin, I met a girl out for a solo backpack who had just startled a mountain lion on the trail. I though that perhaps I should walk for awhile to avoid setting off the cat’s prey drive, but that resolve lasted for all of 100 yards: I wanted this to end. I was even impatient enough to jog parts of the 700-foot climb up from the Belly River to the trailhead. I reached the car just over 14 hours out, and rinsed off and ate as CBP made a pass through the lot, keeping the Homeland safe from… something. I have many peaks still to bag in Glacier, and a new respect for its savagery, but that’s enough for this trip. This entry was posted in Montana, Type II fun. Bookmark the permalink. It’s mostly that it’s about 100 miles from nowhere, and not really on the way between any places I plan to travel.